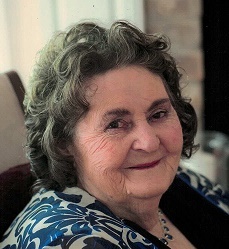 Callie Marie Reynolds passed away on Thursday, January 31, 2019 at the age of 86. She was the beloved wife of the late Russell Reynolds for 38 years. She is the mother of Stella Breaux (Henry), Lillian Lindsey, Sharon Nary (Cliff), and the late Stanley Reynolds. She is the daughter of the late Ellen and Theodore White. Sister of Ralph "Bill" White and the late Eddie Smith, P.J. White, Joe White, Mamie Crawford, Parlee Creech, John "Bus" White, Pearl Smith and Charlie White. Grandmother of Korby Breaux (Karen), Carey Lindsey (Heather), Jaime Breaux, Clayton "Buz" "Doo" Buzbee III, and Rusti "Baby Girl" Wilson (Ryan). Great grandmother of William Lindsey, Sophia Breaux, Ava Breaux, Evan Breaux and Callie Wilson. Also survived by Darryl Roussel and a host of nieces and nephews. She loved her garden and decorating her home for Christmas and was an avid Saints fan and she loved to laugh. She was a native of Blue Hole, Kentucky and a lifelong resident of Waggaman, LA. A celebration of life for Callie Marie Reynolds will be conducted on Saturday, February 9, 2019 at 11 AM at the Rominger Funeral Home Chapel. She will be laid to rest next to beloved husband: Russell Reynolds in the Manchester Memorial Gardens. The family will receive friends and loved ones on Friday evening after 6 PM at the Rominger Funeral Home Chapel.